Morning light hits the Flatirons. A trail runner’s breath floats upward, each step breaking the snowy cushioning below. She moves swiftly over the rocky trail into town — it’s time for fresh-roasted coffee, locally sourced artisan goodies, and fireside whiskey with friends. It’s just another winter day in Boulder. For this Colorado city, winter isn’t the low season. It means cold-weather festivals, a new slate of outdoor activities, full bellies of farm-to-table fare, and so much hot chocolate. There’s a reason Boulder was just named America’s happiest city, and that title isn’t seasonal. With images like these, it’s not hard to see why. Resting along the foothills of the Rockies, Boulder’s proximity to mountains (like Flagstaff, pictured above) allows hikers and climbers to enjoy the 27.8-square-mile urban patchwork from above (just one of the reasons Boulderites are so obsessed with the outdoors). Over 300 B-cycles can be found around town, part of a bike sharing program that lets you rent and return bikes at any of the 42 B-cycle stations. 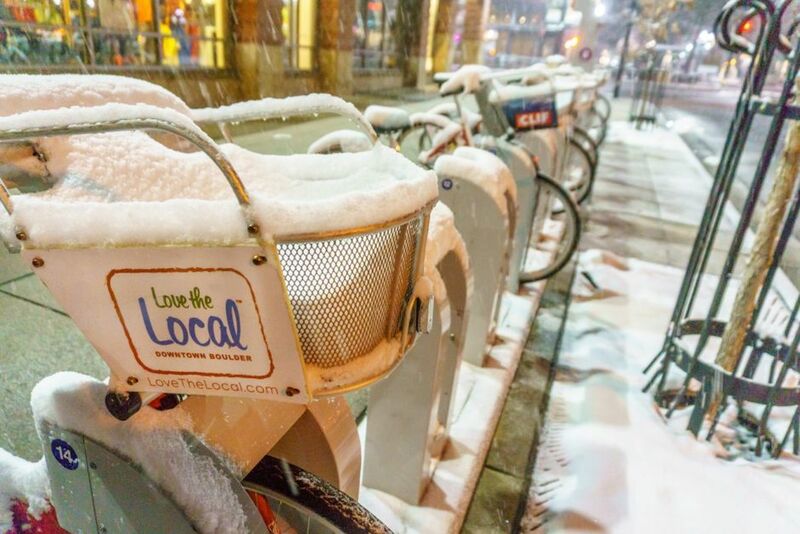 With more than 300 miles of dedicated bikeways, Boulder has ample opportunities to use alternative transportation—not to mention, biking is an all-season sport in Boulder. The bike paths are plowed before the roads! More than a half a million visitors each year make their way to Boulder's Chautauqua Park, a 40-acre National Historic Landmark not far from Open Space and Mountain Parks (a protected natural area). 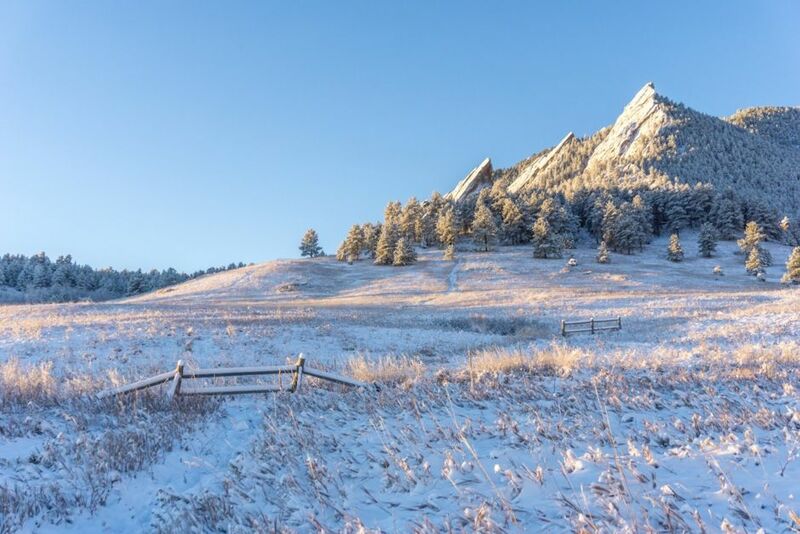 Chautauqua Park also butts up to the iconic Flatirons—which means you'll have access to the popular trails that wind their way through the area. Theaters across Boulder host regular concerts, shows, and a variety of community events every night of the week. 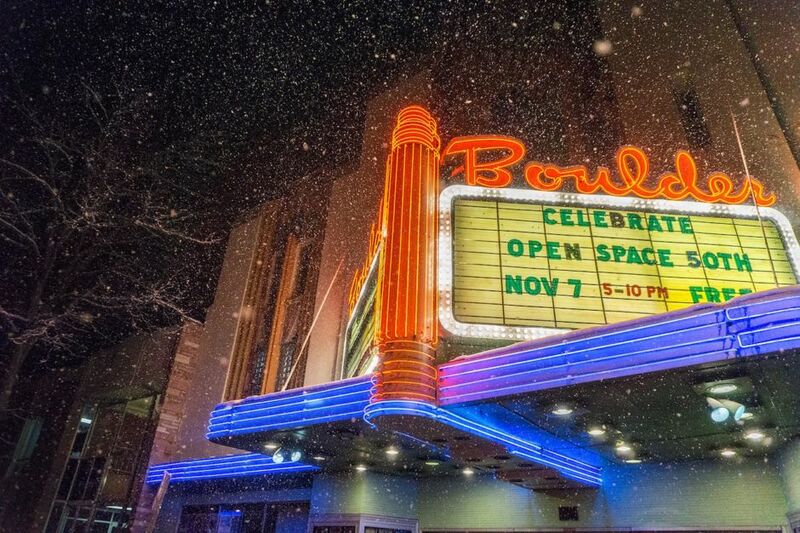 Above, the Boulder Theater is blanketed in snow as it welcomes event-goers into its cozy concert hall. 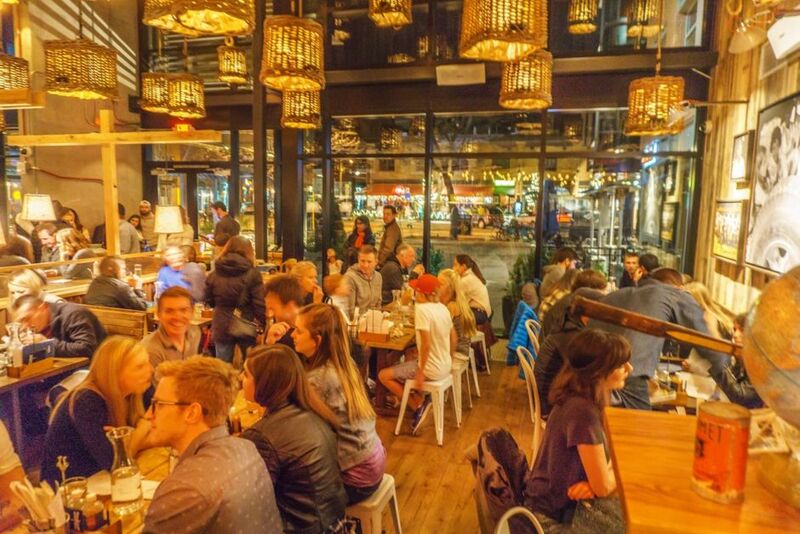 In Boulder, plenty of cozy restaurants and bars are waiting to welcome you as you make your way through the streets on crisp winter evenings. Specialty spots—like Bohemian Biergarten, pictured above—are big players in the creative culinary scene that Boulderites have become so accustomed to. The city is home to over 150 miles of hiking trails throughout its open spaces, so wherever you are in Boulder, there's always nearby access to the wide open outdoors. Few towns have such an incredible balance of urban and natural. 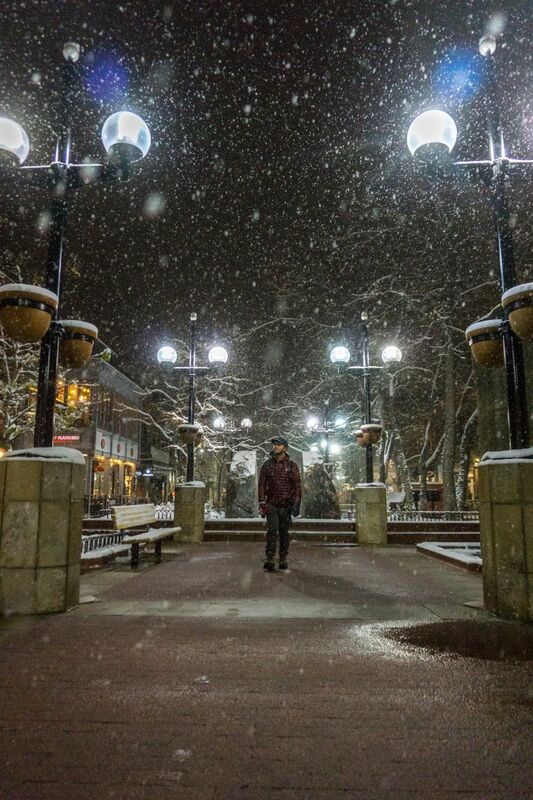 As winter sets in, snow begins to decorate the Pearl Street Mall. It's widely regarded as one of the best open-air pedestrian malls in the country. 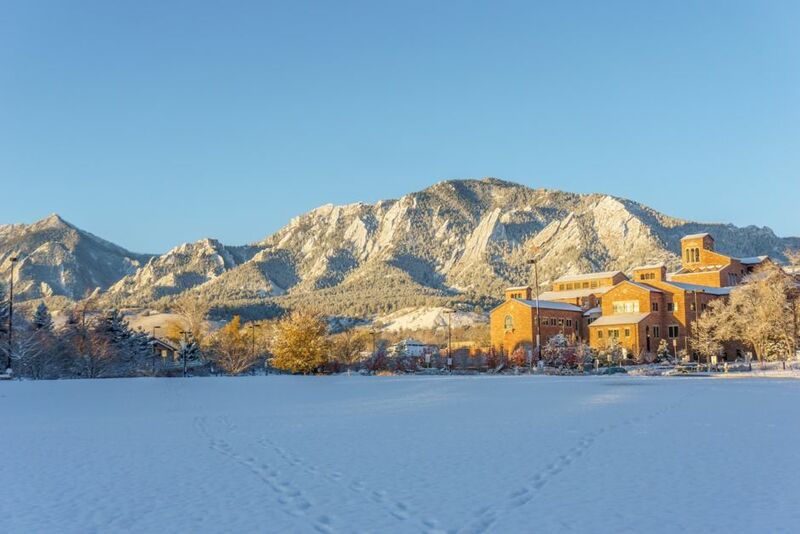 Boulder is flanked by mountains to the west and rolling flatlands to the east, turning it into a snowy wonderland come winter. 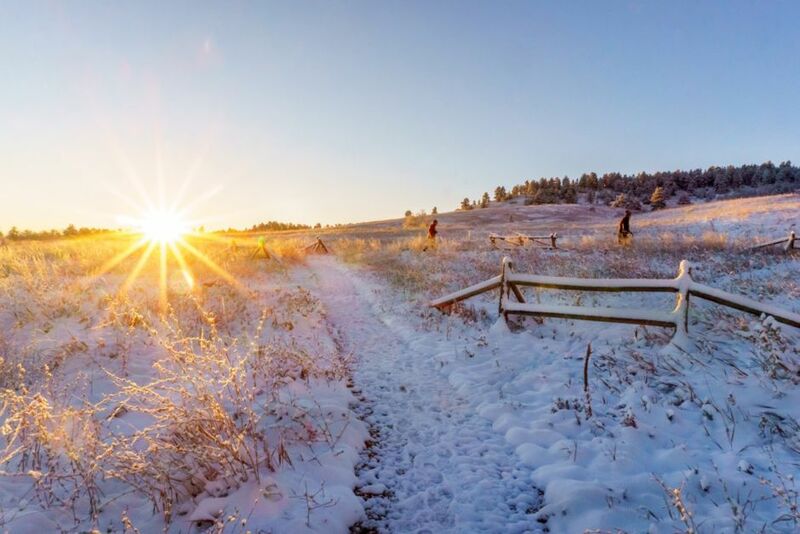 A quick drive up Boulder's Flagstaff Mountain will get you views disappearing into the horizon—this time of year, usually draped in a veil of white. The chill of winter leads bundles of coats and scarves scurrying to warmth. Countless restaurants and bars glow like embers, full of the promise of full bellies. And with so many options, Boulder has something to satisfy every tastebud. The Flatirons jut up dramatically from pine forest below, making them one of the most iconic sights in Boulder. 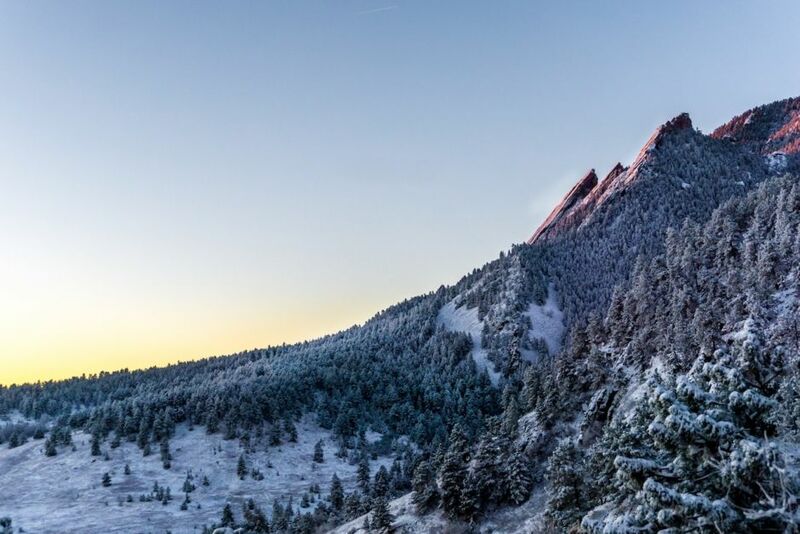 The ample hiking and climbing opportunities and their close proximity to downtown are just two of the reasons the Flatirons are one of the most-loved spots in the city. 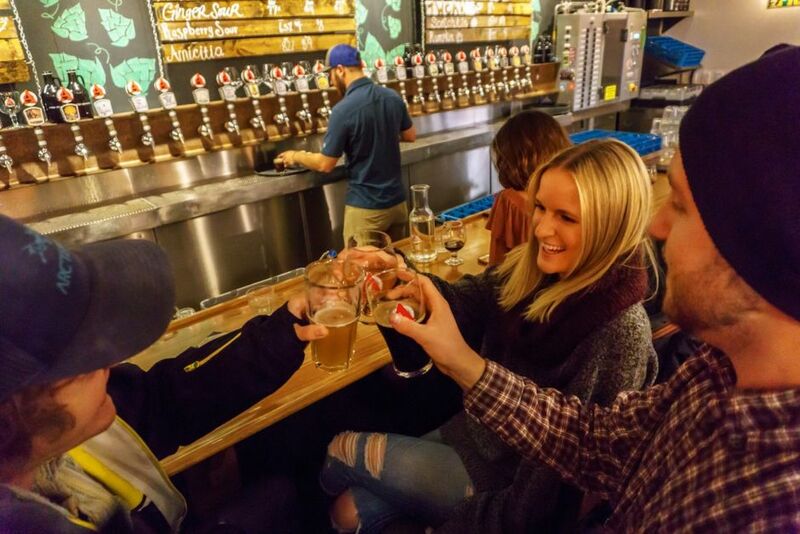 Boulder’s two dozen breweries are a great place to wind down after a long day of sightseeing—or post-afternoon-snowball-fight. Avery Brewing Co. (above) has been making tasty beers since 1993. This city's definitely never been a stranger to the craft beer movement. 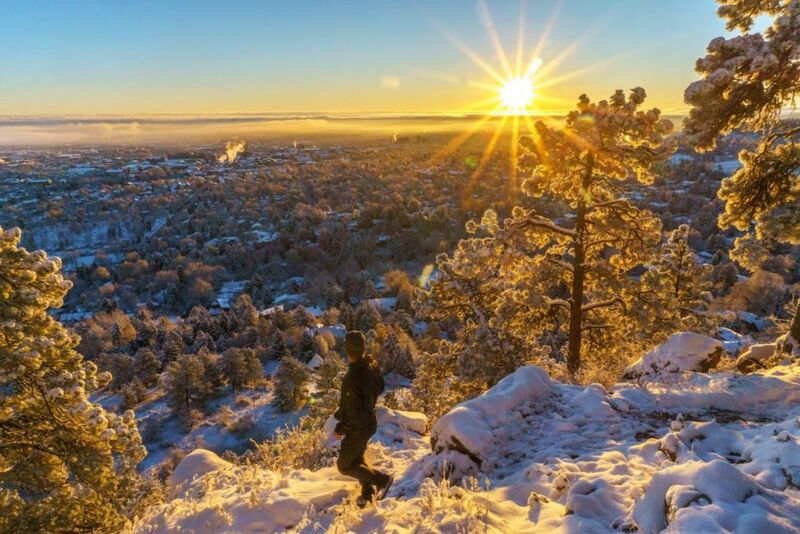 With over 300 days of sunshine a year, a Boulder winter doesn’t mean an idle winter. Grab a beanie and a puffie and take advantage of a warm day. 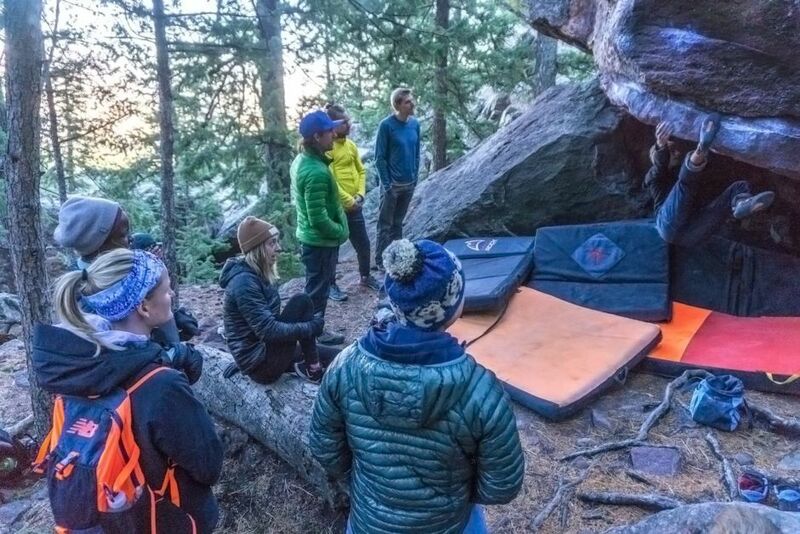 Head out to the base of the Flatirons, where you'll find plenty of other hikers, trail runners, cyclists, and climbers out in the glorious Colorado sunshine. Boulder's known for its intrinsic love for the great outdoors...and its love for a refreshing brew. This explains the city's bustling patios, snow or shine. 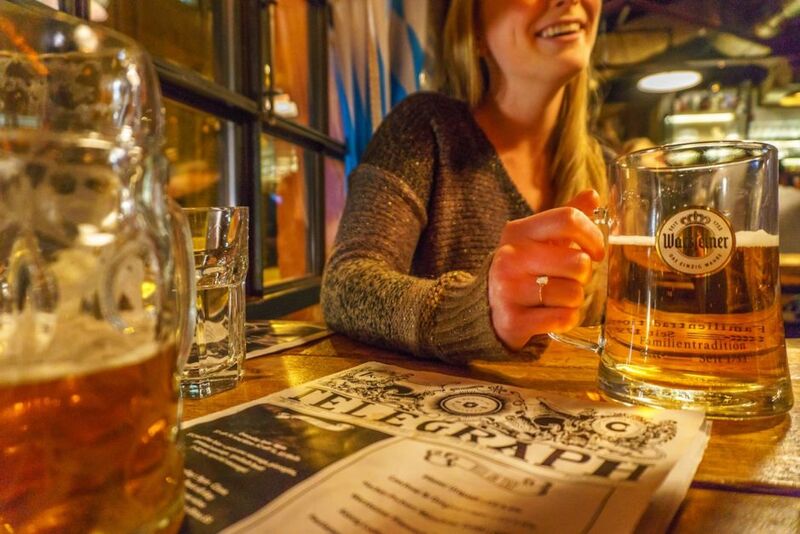 Restaurants and breweries alike offer micro climates of glowing tivoli lights, blazing fire pits, and good friends all around. 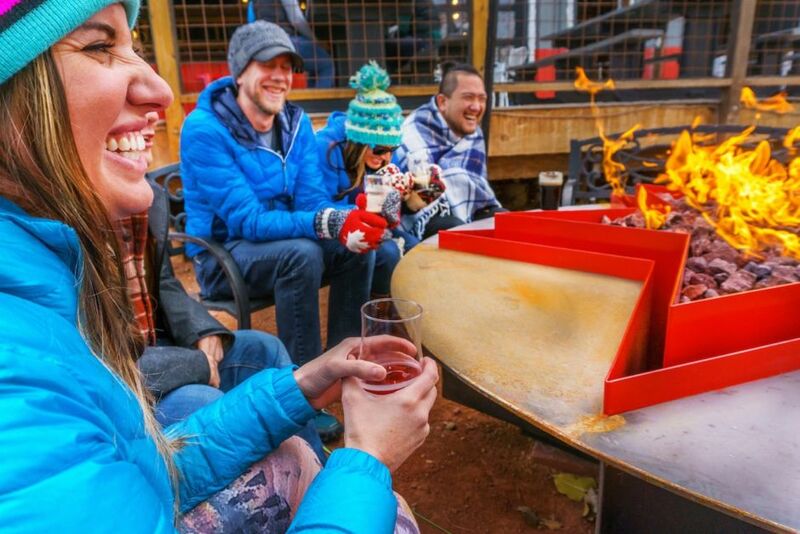 Sitting by the fire and sipping on pints at Sanitas Brewing Co. is a sure-fire way to warm up. The University of Colorado at Boulder is built into the fabric of the city. With over 33,000 students enrolled at the Boulder campus, the university and its students definitely contribute to the eclectic vibe here. It's not just physical fitness that lands Boulder on lists of America's healthiest cities. 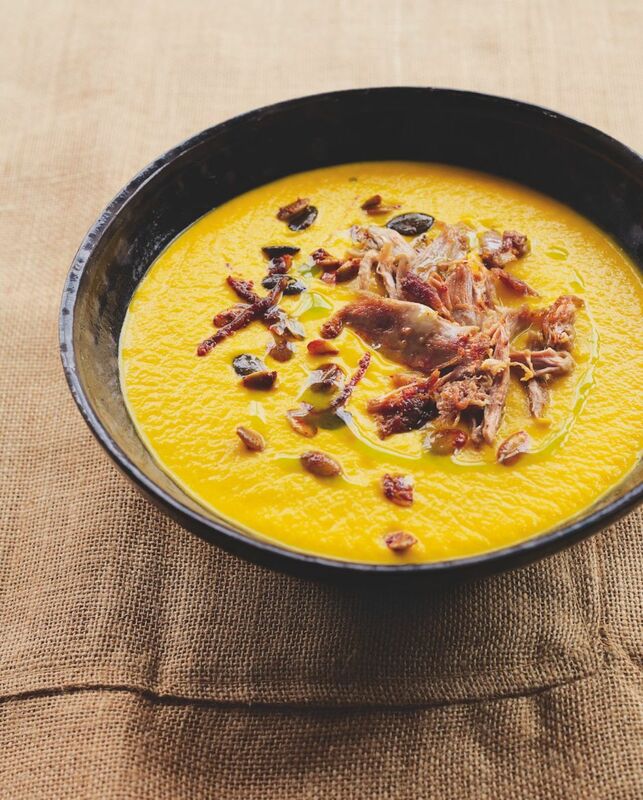 With easy access to organic, locally grown produce and Colorado-raised meats, it's super easy to eat healthy here, too. Even the Emmy-award-winning show Top Chef has taken notice. They filmed an episode of the current season in Boulder—take a look at the insider's guide to the Boulder episode of Top Chef to follow in their foodie footsteps. 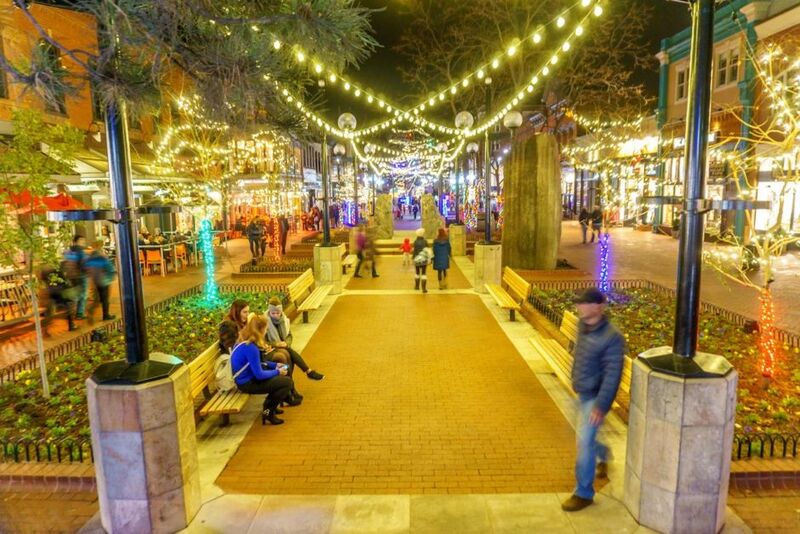 A fusion of trendy, independent shops (check out Alpine Modern, for instance), classic haunts (you've got to visit The Peppercorn), locally owned restaurants, creative street performers, and curious onlookers makes for a vibe that only the spirit and soul of Boulder could create. 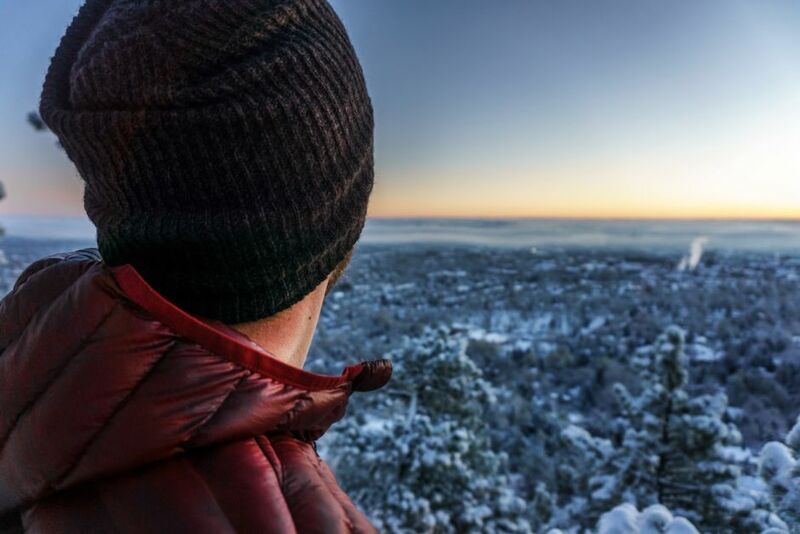 In Boulder, places to escape to on a snowy day are never in short supply. 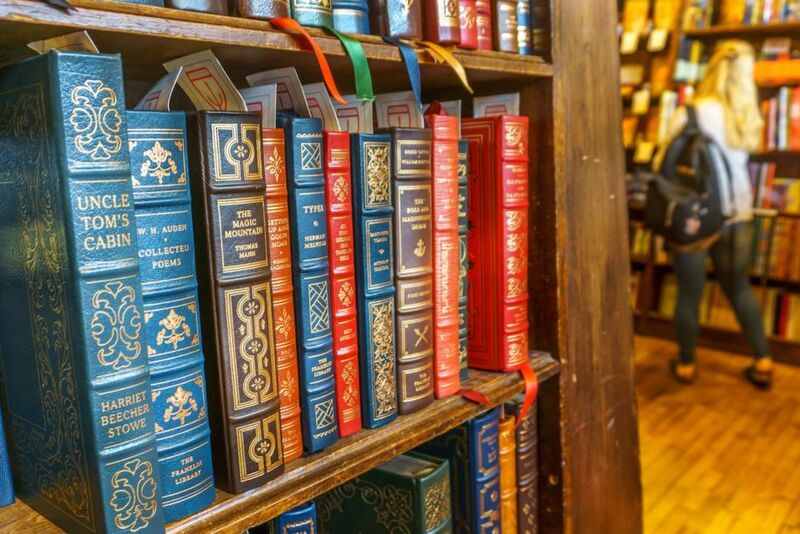 A local favorite, Trident Booksellers and Cafe, greets you with warm tones of dark wood and that oh-so-good smell of books. Boulder has a network of trails along the Front Range that allows for year-round exploration. Whether you want to casually walk two miles or run 100, you'll find something here. 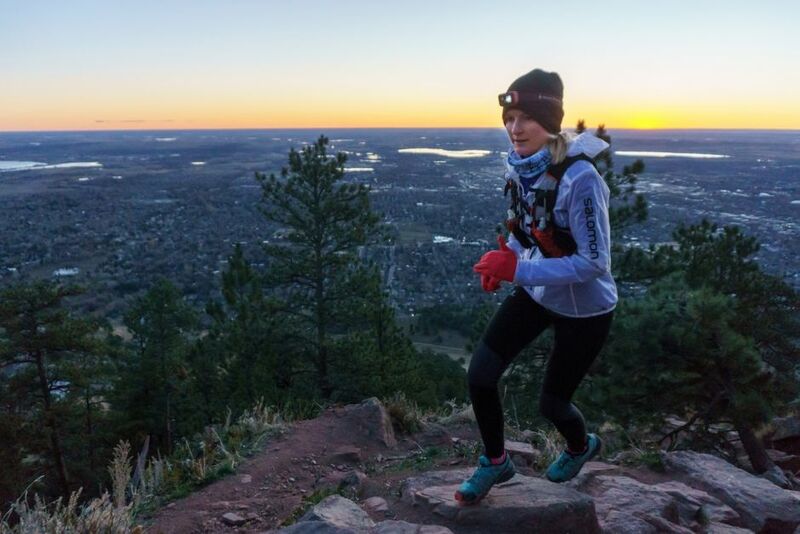 With nearby access to peaks like Sanitas (pictured above), trail runners, dog walkers, and picnickers all venture to the edge of town for some of nature's medicine—right in their backyards. This post is proudly produced in partnership with the Boulder Convention & Visitors Bureau.